Based on the 20th Century Fox sci-fi flick directed by James Cameron, Aliens joins the list of blockbuster hits to make it off the big screen and into the wonderful world of online pokies. This classic movie starring Sigourney Weaver remains as loved today as it did in it 1986, so NetEnt had big shoes to fill when turning Aliens into an online pokies game, but boy did they pull it off! Find out how and where to play the Aliens slot game for real money online. Remaining true to its cinematic namesake, Aliens pokies encapsulates the thrills and chills of the movie, with high-tech graphics and an in-your-face musical score. This game takes a unique approach, consisting of a three-level gameplay that’s hard to compare to any other slots format. 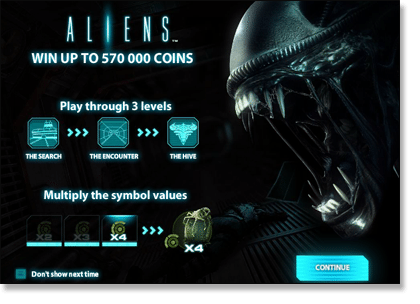 Aliens is one of the most popular online pokies on the market and can be found at a range of sites for free play or real money wagers. We recommend trying out any of the secure online casinos recommended in our table above, with each venue offering its own great welcome bonus and winnings paid out in real Australian dollars. All our recommended casino sites also offer a mobile-friendly platform in which you can play Aliens, available for Apple iPhones and iPads, Android, BlackBerry and Window devices. Some older end WAP and data-enabled phones are also supported. Set against a haunting backdrop with a sinister soundtrack to match, fans of the movie will love Aliens pokies for the true to form graphics and authentic scenes cut straight from the film. Utilising a standard five reel, three row and 15 fixed payline format, the thing that sets Aliens apart is the fact it is played over three levels, making it quite the revolutionary playing format as far as real money online pokies go. The use of levels gives the game a dramatic vibe that’s more like playing a video game than the pokies. Players enjoy the action packed animation sequences that take you deep into the heart of the Alien Hive, with huge bonuses to boot. This is the main game and it runs off the Alien Activity Meter at the top of the screen, which requires nine steps to be filled. Each symbol that appears in a winning line (bar the Wild symbol) are added to the Activity Meter and increase the multiplier by one, while each non-winning spin will also decrease the multiplier by one. Once the Alien Activity Meter reaches step nine it’s time to progress to the next level. Level 2 – The Encounter Level 2 of Aliens really brings the action into full swing, as players fight their way through the corridor with the intention of reaching the Queen Hive. These epic animations combined with such innovating gameplay is what makes this game so ground-breaking. Players are given a pulse rifle with the aim to hit the Ammo Clip symbol in order to keep ammunition levels intact. Running out of ammo will put you all the way back to level one. The Alien Activity Meter needs to hit ten in order to move on to level three. The bonuses and free spins are off the chain during this round and it really is the height of excitement as far as pokies go. 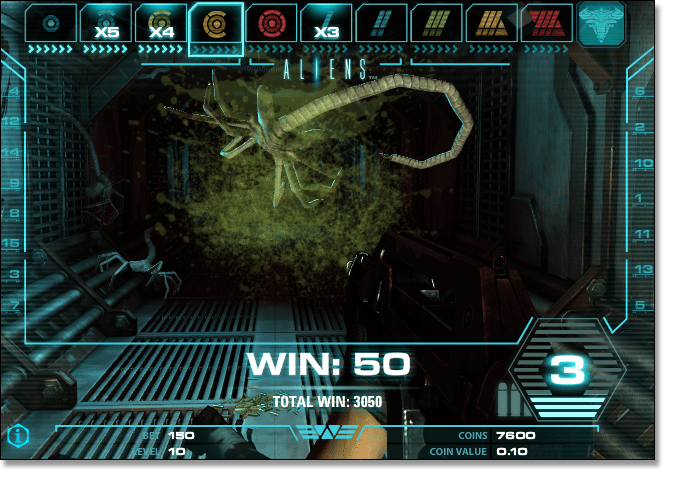 In this final intense level, the aim is to destroy the Hive and kill the Alien Queen before the ammo runs out. Level three introduces a Smartgun, Hive Health Meter, an Ammo Clip Counter with two reels, one grenade multiplier reel and one grenade strength reel loaded with grenades. The Hive Health Meter starts out full and decreases as damage is inflicted against the Queen, which is completed in four steps. Once the Hive Health Meter is down to zero, the Queen has been killed and the Hive successfully destroyed. Winning this level results in a payout of 240 x the current bet. Decent. The bonus rounds and additional wins change between the different levels. The Weyland-Yutani Corporation symbol acts as the games Wild symbol, appearing in reels two to five during level one and anywhere during level two. There are some incredible rewards within this game, with the ultimate being that big bonus for killing the Queen. Aliens is quite different to the usual slots, with bonus rounds that take on arcade game-like formats as you are attacked by otherworldly creatures. Aliens is dramatic, suspenseful and creepy, in the best way possible. The film has been coined the most popular cult sci-fi franchise of all time and the pokies version lives up to this grandeur. Never before has an online slots game been so full of action and intensity. The graphics are so visually pleasing with sound effects that compliment them perfectly (but be warned, this game is LOUD!). Separating play into three distinct levels is something we love and hope to see more of in the future. There would not be an Aliens fan on Earth that wouldn’t agree that NetEnt really nailed this one. Try Aliens at a range of virtual casinos like Emu Casino or G’Day Casino, where Aussies can play for real money in Australian currency. Aliens has also been formatted to a range of mobile devices, so tap any of our casino links directly from your mobile or tablet device and play on the go.